What is the MAP ? Where is the MAP ? 08/11/2018 NEW : FREE DVDs HIRE AT MAP ! We are very proud and grateful d'avoir obtenu the "Travellers' Choice 2014" prize awarded by Tripadvisor, la plateforme Internet mondialement connue, dans la catégorie B&Bs and Inns. 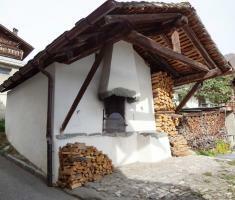 Welcome to the MAP HOSTEL and to VERBIER-VILLAGE... ! The MAP HOSTEL welcomes You, the holiday-maker in search of a peaceful and authentic place to recharge Your batteries and take advantage of the numerous joys of the mountain. Whether You are of a contemplative nature or outright sporty, You will find with us, comfort and cleanliness, maybe a wish to stay longer or definitely to come back and visit again. Ideally located in the heart of the old village of Verbier, 10 minutes walk from the recreational Sports Centre as from the lively and colorful "Main Square", and 15 minutes walk from "Médran", the main ski lifts setting-off point, this beautiful chalet dating from the very beginning of the eighties renews friendships with the past and the tradition, prerogatives of each and every mountain village. In proximity to the many generations of inhabitants, its location near the old village communal oven, the ancient dry-stone chapel, the antiquated "mazots" (small original Swiss barns) and other stone hewed period fountains, preserves its authenticity, away from the touristic effervescence. If You are eager to discover another facet of Verbier - more historical and picturesque - at an unbeatable price ; if it doesn't "katöeye"* You at the thought of sharing Your living space with one or several room-mates for the duration of Your stay and if life in a small community doesn’t phase You, then You have knocked at the right door.